BENEDICT of ANIANE, often called the second Benedict and the second father of monasticism in the West. St. Benedict was a courtier of Kings Pepin (r. 751–768) and Charlemagne (r. 768–814) when he was called to a life of service to the Church. St. Benedict then received monastic tonsure at the Abbey of St. Seine in present-day Saint-Seine-l'Abbaye in the Côte-d'Or, France. In time he was selected to serve as Abbot of St. Seine, an honour he did not wish for, and in response St. Benedict left the abbey for his home of Languedoc. There he built a cell at Aniane, which in time grew to become the Aniane Abbey. St. Benedict's success there was noticed and King Louis the Pious (r. 781–840) charged him with supervising the monastic reforms which were being instituted within Louis' kingdom. Ultimately, St. Benedict's remit was extended to serving as the de facto abbot of all monasteries in the kingdom. St. Benedict reposed at Kornelimünster Abbey (later known as the Abbey of the Abbot Saint Benedict of Aniane and Pope Cornelius) 11th February, 821. CÆDMON, a Northumbrian, who is author of the first recorded poem in English, he is known as the Father of English Poetry. The only source of original information about St. Cædmon is from St. Bede the Venerable’s (25th May) Historia ecclesiastica , in which he relates that St. Cædmon was a lay brother who worked and cared for the animals at Whitby Abbey. One evening, while the monks were feasting, singing, and playing a harp, St. Cædmon left early to sleep with the animals because he knew no songs. St. Bede the Venerable implies that St. Cædmon felt he lacked the knowledge needed to compose the words to songs. While sleeping, St. Cædmon had a dream in which “someone” (quidam) approached him and asked him to sing principium creaturarum (the beginning of created things). After first refusing to sing, Cædmon subsequently produced a short eulogistic poem praising God, the Creator of heaven and earth. Upon awakening the next morning, Cædmon not only remembered everything he had sung in his dream but added additional lines to his poem. After telling his foreman about this dream, he was taken immediately to see the abbess, believed to be St. Hilda (17th November), who closely questioned St. Cædmon about his dream. Satisfied that it was a gift from God, the abbess gave him a new commission as a test; this time for a poem based on “a passage of sacred history or doctrine”. Upon returning the next morning with the requested poem, St. Cædmon was ordered to take monastic vows. The abbess then ordered her scholars to teach St. Cædmon sacred history and doctrine, which after a night of reflection; St. Cædmon would turn into the most beautiful poetry. According to St. Bede the Venerable, St. Cædmon was responsible for a considerable number of splendid vernacular poetic texts on a variety of Christian topics. After a long and zealously pious life, St. Cædmon, having received a premonition of death, asked to be moved to the abbey’s hospice where, having gathered his friends around him, he expired, after receiving the Holy Eucharist circa 680.
eternal Lord, instilled at the origin. the earth for men, father almighty. CALOCERUS, a disciple of St. Apollinaris (23rd July) first Bishop of Ravenna. St. Calocerus ably assisted St. Apollinaris in attending to the See for many years, and upon St. Apollinaris' repose St. Calocerus was consecrated second Bishop of Ravenna. St. Calocerus reposed circa 130. DESIDERIUS (DIDIER) , educated in Vienne, and a noted scholar, St. Desiderius served as an Archdeacon, and circa 590, was consecrated 13th Archbishop of Vienne. Conflict with Queen Brunehaut (r. [as Regent] 575–583, 595–599, and 613) over the moral depravity of the Court, led the Queen to exile him, as well as having him deposed. She relented four years later and allowed St. Desiderius to return to his See. However, the saint continued his reproach of the Court's depravity, leading to Queen Brunehaut to have St. Desiderius assassinated at present-day Saint-Didier-sur-Chalaronne circa 608. St. Desiderius' relics were later enshrined at Vienne. GOBNATA (GOBNET), according to legend, an angel appeared to St. Gobnata one day and told her to leave her home, and to keep walking until she found nine white deer. She saw three white deer at Clondrohid, Co. Cork, and decided to follow them. Then, at Ballymakeera, she saw six white deer. Finally, at Ballyvourney she came upon nine white deer grazing in a wood. There she was given land for a women’s monastery by her spiritual father, St. Abban of Kill-Abban, Co. Laois (16th March), and he installed her as abbess. A holy well still exists there named for St. Gobnata. The patron saint of Ballyvourney, she is venerated throughout southern Ireland; there are churches dedicated to her in Waterford and Kerry. She is also revered in Scotland. The exact year of her repose is unknown, though it was most probably in the sixth century. GREGORY II, elected 89th Pope of Rome in 715, St. Gregory stopped heresy and restored discipline amongst monastics and clerics. He also consecrated SS. Boniface (5th June) and Corbinian (8th September) missionary bishops and despatched them to evangelise the tribes of Germany. St. Gregory reposed in 731. LAZARUS of MILAN, consecrated the (eighteenth?) Archbishop of Milan circa 439. St. Lazarus' episcopacy was occupied with supporting his flock during the Ostrogoths invasion. St. Lazarus reposed circa 450. MARTYRS of NORTH-WEST AFRICA, martyrs in Numidia during the Diocletianic Persecution, circa 303. They are known as the Guardians of the Holy Scriptures — as they chose martyrdom over surrendering their sacred books to be burnt. 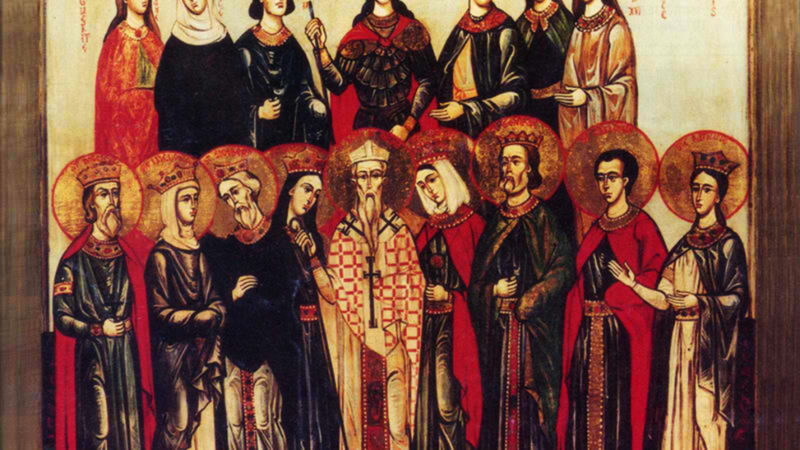 SATURNINUS, DATIVUS, FELIX, AMPELIUS, VICTORIA, and COMPANIONS, a group of upwards of fifty, who were arrested, tortured, and then martyred during the Diocletianic Persecution, circa 304. SEVERINUS, an Abbot of Abbey of St. Maurice, Agaunum in Valais (the location of the martyrdom of the Theban Legion). St. Severinus was a wonderworker, Clovis, King of the Franks was witness to several of the saint's miracles. St. Severinus reposed circa 507.